Shin’ichirō Tomonaga was awarded the Nobel Prize in Physics in 1965 alongside Julian Schwinger and Richard P. Feynman "for their fundamental work in quantum electrodynamics, with deep-ploughing consequences for the physics of elementary particles." Tomonaga was a major influence on physics in Japan and the Quantum Electrodynamics field, which many had thought to abandom prior to his theoretical research. March 31, 1906Birth, Kyoto (Japan). 1929Obtained BSc in Physics (Rigakushi), Kyoto Imperial University (Kyōto Teikoku Daigaku), Kyoto (Japan). 1937 – 1939Studied abroad under Werner Heisenber, University of Leipzig, Leipzig (Germany). 1939Obtained PhD in Physics (Rigakuhakushi), Toyko Imperial University (Tōkyō Teikoku Daigaku), Tokyo (Japan). 1941Professor of Physics, Bunrika University (Tōkyō-Bunrika-Daigaku), later to be absorbed into the Tokyo University of Education (Tōkyō-Kyōiku-Daigaku), Tokyo (Japan). 1944Lecturer, Tokyo Imperial University (Tōkyō Teikoku Daigaku), Tokyo (Japan). 1949Visiting Scholar, Princeton University, Princeton (N.J.). 1951Member, The Japan Academy (Nihon Gakushiin). 1955Served a leading role in the establishment of the Institute of Nuclear Study, University of Tokyo (Tōkyō Daigaku). 1956 – 1962University President, Tokyo University of Education (Tōkyō-Kyōiku-Daigaku), Tokyo (Japan). 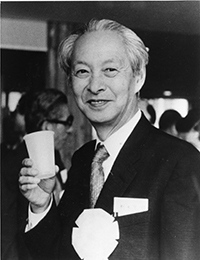 1962 – 1969Director, Institute of Optical Research, Tokyo University of Education (Tōkyō-Kyōiku-Daigaku), Tokyo (Japan). 1963 – 1969President, Science Council of Japan (Nihon Gakujutsu Kaigi), Tokyo (Japan). 1964Awarded the Lomonosov Medal, U.S.S.R Academy of Sciences. July 8, 1979Death, Tokyo (Japan). Awarded the 1965 Nobel Prize in Physics along with Julian Schwinger "for their fundamental work in quantum electrodynamics, with deep-ploughing consequences for the physics of elementary particles." Advisor at University of Leipzig (Universität Leipzig). Advised by Tomonaga at University of Tokyo. PhD advisor at Institute of Physical and Chemical Research (Rikagaku Kenkyūjo (Japan)). Awarded the 1965 Nobel Prize in Physics along with Richard Feynman "for their fundamental work in quantum electrodynamics, with deep-ploughing consequences for the physics of elementary particles." Established Institute of Nuclear Study. University President and Director, Institute of Optical Research. Received PhD in Physics (1939) and Lecturer. Awarded the Lomonosov Medal (1964). Received BSc in Physics (1929). Temporarily pursued Ph.D. in the Nishina Laboratory. Studied under W. Heisenberg as a graduate student. Oral history interview with Minoru Oda, 1988 August 5. Quantum mechanics /by Sin-itiro Tomonaga ; translated from the Japanese by Koshiba. Scientific papers of Tomonaga, edited by T. Miyazima. Sin-itiro Tomonaga : life of a Japaneese physicist / edited by Makinosuke Matsui ; English version and annotated by Hiroshi Ezawa ; translated from the Japanese by Cherly Fujimoto and Takako Sano. The story of spin / Sin-itiro Tomonaga ; translated by Takeshi Oka. S. Tomonaga Nobel Prize biography. The National Mag Lab: History of Electricity and Magnestism Pioneers: Sin-itiro Tomonaga biography.